This page provides visa information for UK Citizens wanting to travel to the Bahamas. 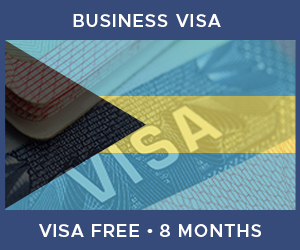 Visa Status: Visa Free Travel Citizens of the United Kingdom do not require a visa to travel to the Bahamas as long as their stay is shorter than the maximum stay. Maximum Stay: 8 months The maximum stay refers to the total amount of time that you can remain in the country during a single visit. For longer stays, you would either need to consider a residents visa or leave and re-enter the country using a multiple visit visa. British Nationals can stay in the Bahamas for up to 21 days, however this can be extended up to a maximum of 8 months by applying to the Department of Immigration in Nassau. If you are travelling to the Bahamas via the USA, you will be required to apply for a USA ESTA, and any time spent in the Bahamas will count towards the 90-day maximum permitted stay in the USA. Your passport must be valid for 6 months from the date of departure from the Bahamas. All visitors leaving the Bahamas are subject to a departure tax, which may or may not be included in the price of your ticket. You should check with your airline to confirm this. Citizens of the United Kingdom can enter the Bahamas without a visa for up to 8 months. The information found here is based on the response provided by the Bahaman embassy. We recommend you always double check the latest information directly with the embassy before you travel. If you wish to travel for longer than the visa-free period, you should speak to the Bahaman embassy directly on 0207 408 4488. In order to travel to the Bahamas there are a few requirements. Click on any of the icons below to learn more about each one. All visitors are subject to a departure tax. Check with your flight company to see if this is included in your flight.